I have written previously about the deplorable government 'stewardship' of our natural resources that allows rapacious companies like Nestle to take Ontario's groundwater for literally pennies as it makes obscene profits on bottle water. Unfortunately, the story keeps getting worse. Corporate giant Nestlé continued its privatization creep on Thursday as it won approval to take over another Canadian community's water supply, claiming it needed the well to ensure "future business growth." Nestlé purchased the well near Elora, Ontario from Middlebrook Water Company last month after making a conditional offer in 2015, the Canadian Press reports. In August, the Township of Centre Wellington made an offer to purchase the Middlebrook well site to protect access to the water for the community. Consequently, the multinational—which claimed it had no idea the community was its competitor—waived all its conditions and matched the township's offer in order to snag the well for itself. "Groundwater resources will not be sufficient for our future needs due to drought, climate change, and over-extraction. Wasting our limited groundwater on frivolous and consumptive uses such as bottled water is madness. We must not allow groundwater reserves to be depleted for corporate profit." For her part the extraordinarily unpopular Ontario Premier Kathleen Wynne, who has often acted as if she is surprised by Nestle's pillaging, is now sounding a cautious note. “As we look at the water bottling industry, that has to be a question because we’re talking about what we could argue is our most precious resource,” she said. 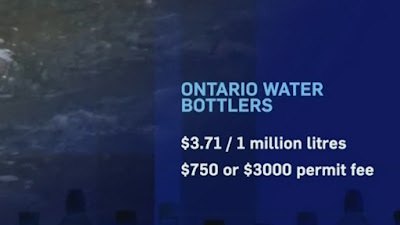 Nestle, which has 2,500 employees in Ontario, has said it is prepared to pay more if rates were increased, but only if all companies with water-taking permits face the higher fees. The fact that this multinational company feels free to stipulate conditions on government decisions tells you all you need to know about who is really running the show, doesn't it?